Fujinuma Noboru’s early interests were photography and engineering. At 27, he traveled to Paris and returned home intent on studying traditional Japanese arts. 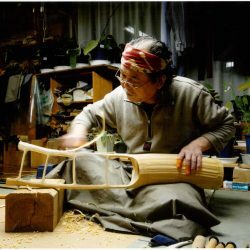 Shortly thereafter, he quit his job at Nikon to apprentice with the respected bamboo basket maker Yagisawa Keizo. For half-a-dozen years, he struggled to execute his design ideas because he lacked confidence in his technique. This changed by 1992 when, his reputation growing, he received the Tokyo Governor’s Prize at the 39th Traditional Craft Arts Exhibition. His winning piece was purchased by the National Museum of Modern Art in Tokyo. Fujinuma was named as a Living National Treasure of Japan in 2012. In addition to exhibitions of his work in numerous art museums, Fujinuma was featured in a solo show in at the Chicago Art Institute in 2011 and in 2005 at the Japanese American Cultural and Community Center in Los Angeles. His pieces are part of collections at the Metropolitan Museum of Art; British Museum, London; National Museum of Modern Art, Tokyo; Art Institute of Chicago; Asian Art Museum, San Francisco; Minneapolis Institute of Art; and the Denver Art Museum. Fushi, “nodes” in my language, also means “milestone,” as in the events that demarcate the stages of life. This new body of work is a personal milestone. The labor was intensive but at the same time it was also a very joyful and satisfying process. Every piece of bamboo is different and selecting lengths of the right diameter, curvature, and spacing of the fushi was key to my inspiration. In the forest I might look at one hundred mature bamboo plants before finding one which suited my vision. This one I would cut down and thus the process had begun. I then cut into the bamboo and sculpted it’s surface and over many month’s time apply more than one hundred layers of colored natural lacquer. Then, I would sand back through the layers to expose the artwork’s hidden beauty. The dialog between the fushi and myself guides the creation process and was much more direct than I have ever experienced before. There were answers to be found everywhere, I simply needed to eliminate the self and seek them. By revealing the hidden anatomy of the “nodes” that our eyes cannot see from the outside, I hope to share with the viewer my experience of looking for answers about life.